Some scientists see religion as a threat to the scientific method that should be resisted. But faith “is really asking a different set of questions,” says Collins. Francis Collins: Science is about trying to get rigorous answers to questions about how nature works. And it’s a very important process that’s actually quite reliable if carried out correctly with generation of hypotheses and testing of those by accumulation of data and then drawing conclusions that are continually revisited to be sure they are right. So if you want to answer questions about how nature works, how biology works, for instance, science is the way to get there. Scientists believe in that they are very troubled by a suggestion that other kinds of approaches can be taken to derive truth about nature. And some I think have seen faith as therefore a threat to the scientific method and therefore it to be resisted. But faith in its perspective is really asking a different set of questions. And that’s why I don’t think there needs to be a conflict here. The kinds of questions that faith can help one address are more in the philosophical realm. Why are we all here? Why is there something instead of nothing? Is there a God? Isn’t it clear that those aren’t scientific questions and that science doesn’t have much to say about them? But you either have to say, well those are inappropriate questions and we can’t discuss them or you have to say, we need something besides science to pursue some of the things that humans are curious about. For me, that makes perfect sense. But I think for many scientists, particularly for those who have seen the shrill pronouncements from extreme views that threaten what they’re doing scientifically and feel therefore they can’t really include those thoughts into their own worldview, faith can be seen as an enemy. And similarly, on the other side, some of my scientific colleagues who are of an atheist persuasion are sometimes using science as a club over the head of believers basically suggesting that anything that can’t be reduced to a scientific question isn’t important and just represents superstition that should be gotten rid of. Part of the problem is, I think the extremists have occupied the stage. Those voices are the ones we hear. I think most people are actually kind of comfortable with the idea that science is a reliable way to learn about nature, but it’s not the whole story and there’s a place also for religion, for faith, for theology, for philosophy. But that harmony perspective does not get as much attention, nobody’s as interested in harmony as they are in conflict, I’m afraid. 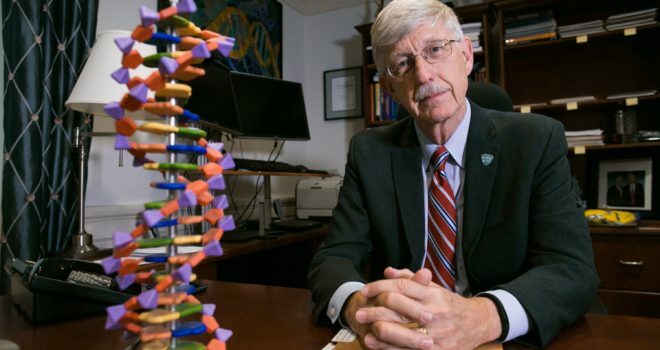 Francis Collins: My study of genetics certainly tells me, incontrovertibly that Darwin was right about the nature of how living things have arrived on the scene, by descent from a common ancestor under the influence of natural selection over very long periods of time. Darwin was amazingly insightful given how limited the molecular information he had was; essentially it didn’t exist. And now with the digital code of the DNA, we have the best possible proof of Darwin’s theory that he could have imagined. So that certainly tells me something about the nature of living things. But it actually adds to my sense that this is an answer to a “how?” question and it leaves the “why?” question still hanging in the air. Other aspects of our universe I think also for me as for Einstein raised questions about the possibility of intelligence behind all of this. Why is it that, for instance, that the constance that determines the behavior of matter and energy, like the gravitational constant, for instance, have precisely the value that they have to in order for there to be any complexity at all in the Universe. That is fairly breathtaking in its lack of probability of ever having happened. And it does make you think that a mind might have been involved in setting the stage. At the same time that does not imply necessarily that that mind is controlling the specific manipulations of things that are going on in the natural world. In fact, I would very much resist that idea. I think the laws of nature potentially could be the product of a mind. I think that’s a defensible perspective. But once those laws are in place, then I think nature goes on and science has the chance to be able to perceive how that works and what its consequences are. ← Is there definitive proof of the existence of God?